Babblings of a Mommy: A Spring Makeover And A Crocs Giveaway--Just For You!!--CLOSED. A Spring Makeover And A Crocs Giveaway--Just For You!!--CLOSED. Don't we all wish we could get a Spring Makeover with a nationally recognized style expert? Well, that's exactly what Crocs is doing for us this spring!! Crocs has totally re-vamped their signature style and created new trendy styles with vibrant translucent colors, just in time for Spring! Remember the ever so popular jelly shoes back in the day? (Yes, I had a few. Don't hate.) Well, these new Crocs are reminiscent of those--but with a much more modern touch and also the comfortability that comes with being made with their proprietary Cross-Lite material with circulation nubs. It's like a mini-massage for your feet! Plus, with all these styles being under $49.99, we won't have to worry about breaking our piggy banks. 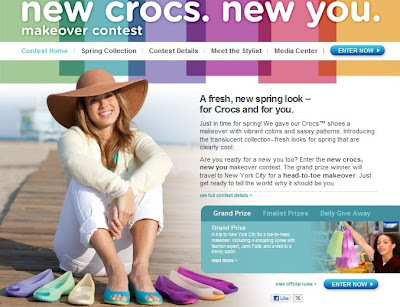 In celebration of these new styles, Crocs is launching an amazing Spring Makeover Contest called: New Crocs. New You. The grand prize winner will get to travel to New York City for a head-to-toe makeover which includes a shopping spree with a nationally-recognized fashion and beauty expert Jennifer Falik, and a visit to a hip trendy salon. All you have to do is simply go to www.crocs.com and upload a photo and answer why you deserve this makeover--That's it! 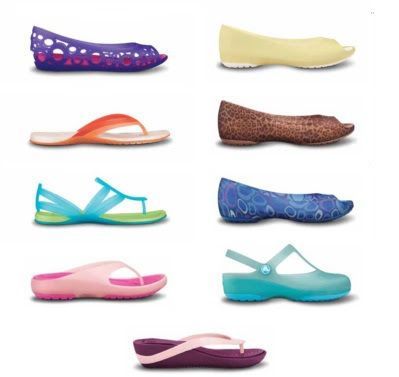 Each day Crocs will be randomly selecting 3 lucky participants to win a pair of their new translucent styles! Plus just for entering Crocs will be donating $5 for every entry to Dress to Success, which is an amazing organization that helps women succeed in not only work, but in life too. Hurry! Contest ends April 15th. Be sure to also watch this video from Jenn Falik where she provides information on the New Crocs. New You Contest and also gives us a few fashion tips on how to spruce up our spring wardrobe! Go to Crocs.com and tell me which spring style you love and would choose--That's it! Become a Facebook fan and "like" my page. Be sure to leave a comment about the contest! Follow me on Twitter and tweet this to me: "I hope I win the Crocs Spring Giveaway at http://babblingsofamommy.blogspot.com @babblingofmommy"
Add my button to your site. It's that simple! Remember each one counts as a different entry so be sure to enter them separately. Giveaway ends April 8th . A winner will be selected by random.org and will be announced on my blog, so be on the lookout for your name! I love the Adrina Strappy Sandal. I am a new GFC follower. I have subscribed to your feed. I liked your page on facebook. I made sure to use my own facebook account & not my page. That way it counts towards your numbers. Liked as Norma Wilkinson Wills. I would love the Women's Carlie Mary Jane in Espresso/Bronze! I like the Carlie platform flip in seafoam. I voted for you on Top Mommy Blogs and Picket Fence Blogs. I like the Adrina Flat in Aqua/Celery would be cut efor Easter! I like the Carlie Mary Jane in Espresso/Bronze. I'm already a GFC follower. I follow your tweet tweets and just tweeted about wanting to win those cute little crocs! Think I'd love those Adrina strappy sandals in aqua/celery. Seems like a perfect fit for being at Six Flags with my kids this summer. I love the Carlie platform flip in celery & sea foam. I'd love the Adrina Flat in black. Would love to try the platform flip in black! I like the Adrina Flat in aqua/celery. I'd chose the Adriana Strappy Sandals. I love the Adrina Flat in Espresso Bronze. Thanks! Subscriber to your feed via email. I love the Carlie flats! Carlie Flat in Khaki/Expresso...so cute! I love the Women's Carlie Mary Jane in Espresso/Bronze. They're perfect for my work, since I have to wear a closed toe! I voted for you on Top Mommy Blogs & Picket Fence Blogs! I would choose the Carlie Platform Flip in black. too cute. PS: I went to college with Jenn so I should totally win. I'm torn between the Adrina and the Carlie! I now follow you publicly on Google Friend Connect (Lauren @ Hobo Mama). I subscribe via RSS feed in a reader. voted on top mommy blogs too! already like you on facebook! Left a comment saying I entered! I'd go with the Carlie Platform Flip, Oyster/Grapefruit! So cute!